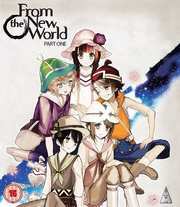 Born into a world a thousand years in our future, Saki and her friends Satoru, Maria, Mamoru and Shun have lived their entire lives in what seems to be a perfect utopia. Not only is their small, idyllic community overflowing with clean rushing water and abundant green foliage, but almost all technology has been rendered irrelevant by the magical power of "Juryoku," the psychic ability to materialize anything one desires. But when Saki discovers a long-lost artifact from the past, the facade of their world is shattered and the cracks that split the foundation of their reality threaten to swallow them whole! Faced with a bloody secret history of how their world really came to be and thrust into a nightmarish new paradigm, Saki and her companions are confronted with dangers they never knew existed and a series of choices that may change the fate of every intelligent creature on the planet - human and otherwise!